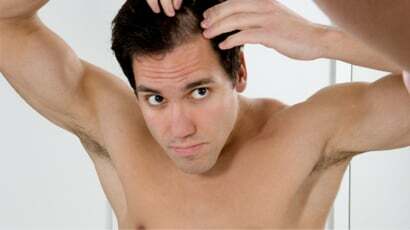 Hair loss generally refers to the male pattern baldness. It is medically referred as Androgenic Alopecia. Male hair loss affects a person at any time after puberty. The hair usually recedes the letter and the crown hair becomes thinner as age advances. Hair loss is common in men and women. But a lot more men suffer from hair loss than women. The adult scalp contains about 100,000 hair follicles. Everyday the scalp loses about 100 hairs and they will grow back in 5-6 weeks. Starting at age 40, the levels of by product prolactin of testosterone of men increases, stimulating the production of the enzyme 5-alpha reductase that causes the conversion of testosterone to gihydro testosterones DHT causing our hair to grow back thinner or not grown back at all. This causes an androgenic alopecia hair loss problem, since DHT shrinks the follicles causing hair thins and hair receding at the forehead, crown and temple for men and thins over the entire scalp for women. Human aging is the biological process that is unavoidable but controllable with healthy diet with complex carbohydrates, green foods, garlic, onion, water and juices that will help to decrease the aging process in some degree. It also helps to reduce the amount of DHT produced in our body, result in postponing hair loss to our scalp. Minerals such as calcium, iron, copper, chromium, iodine, zinc, and magnesium are necessary to maintain healthy hair growth. Mineral deficiency will reduce the chance to regulate the blood circulation that promotes healthy hair growth and thyroid hormones that prevent dry hair and hair loss as well as defects in hair color. Too much iron is toxic to your body. Oxygen deficiency in your blood weakens the hair follicles, leading to dryness of the scalp and hair loss. Uncontrolled diet that is high in saturated fat causes cholesterol building up in your arteries resulting in less oxygen in your blood stream. Also cigarette smoking and second hand smoke reduces the blood flow and increases the blood clotting activity of cells which would clog the blood flow and damage arteries causing oxygen deficiency and results in weaken of the hair follicles. Some medications contains elements that might cause hair loss such as lithium, warfarin, heparin, and amphetamines. When hair loss is a side effect of a medication, hair growth usually returns to normal once the drug is stopped. The psychological impact of women's hair loss is extensive when compared to men since women consider their hair as a vital part of their beauty and find it to be an important part of their outer appearance. Women's hair loss has different reasons. Heredity is one of those. Moreover the treatment of women's hair loss is entirely different than that of men, because the medication offered for re-growth of hair may cause the growth of hair on other parts of the body such as chest, back, and face. Most women don't like facial hair growth.